Motor City thrashers BATTLECROSS have just returned home from a successful trip to Bogota, CO, and nearly immediately upon returning, have launched a brand new song from their forthcoming album, Rise To Power! The new song, "Not Your Slave", is streaming below, and pre-order bundles are available at metalblade.com/battlecross. Rise To Power will be released worldwide on Metal Blade Records on August 21st, 2015. The record was produced by Jason Suecof and mixed/mastered by Mark Lewis at Audiohammer Studios. Cover art was completed by Hungarian artist Péter Sallai (SABATON, SACRED STEEL). As previously announced, BATTLECROSS will join CROWBAR and LORD DYING on The Summer Of Doom Tour, with the devastation beginning May 28th and ending July 3rd in CROWBAR's home state of Louisiana. On tour, fans can pre-order Rise To Power at the BATTLECROSS merch booth in the form of a limited edition tour laminate, only available at the merch booth. Each laminate will include a code, redeemable online, for a copy of the album! The Summer Of Doom is the first tour for BATTLECROSS since finishing the production for Rise To Power, their third Metal Blade release. The tour also puts an end to the band's search for a permanent drummer, with bay area's Alex Bent now firmly in place behind the kit. After performing with the band on two 2014 headliners and in South America, Alex officially joined and tracked drums for the new album. BATTLECROSS will also appear at the 2015 Heavy MTL in Montreal on August 8th. Summer Of Doom Tickets are on sale now. 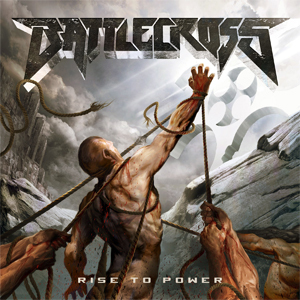 BATTLECROSS' previous album, War Of Will, debuted at #134 on the Billboard Top 200 chart upon its release in July of 2013. This was the band's first ever Billboard chart debut! War Of Will also peaked at #3 on the US iTunes metal chart on the day of release. Watch the music video for "Never Coming Back" now at metalblade.com/battlecross.